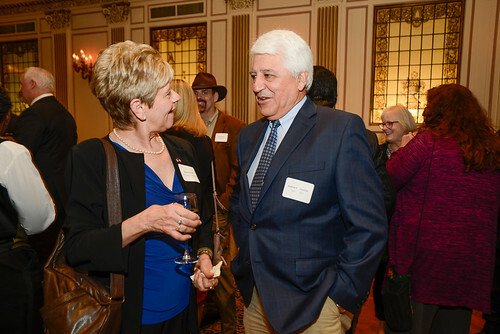 On Wednesday, April 26th, the Chilean and American Chamber of Commerce of Greater Philadelphia (CACCGP) hosted the 12th Annual Experience the Taste of Chile Wine Tasting and Dinner. The evening was full of spirited conversation and incredible Chilean food and wine. 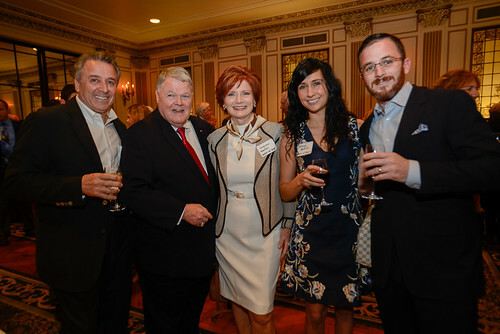 The night began with a reception and Chilean wine tasting; afterwards, guests were escorted into the Hotel Du Pont’s Gold Ballroom for dinner and the award ceremony. CACCGP Treasurer Miriam Borja-Fisher opened up the evening with a warm welcome, thanking all attendees and sponsors for their continued support of the Chamber. She gave a very special welcome to the Chilean Delegation that was visiting from the VI Region (O’Higgins) in Chile, which included the 2014 Visionary Award Recipient: Alejandro García-Huidobro, Senator of the Republic of Chile, VI Libertador General of Bernardo O’Higgins Region and his wife María-Eugenia, as well as: Felipe García-Huidobro (Council member of the O’Higgins Council), Cristina Marchant (President of the Agricultural Committee of the O’Higgins Council), Fernando Verduro (President of the O’Higgins Council), Sebastian Zulueta (Executive Director of America Solidaria), and Rebecca Nelson (Director of America Solidaria US). In addition, Borja-Fisher gave a gracious thank you to the sponsors for the evening: Visionary Sponsor The Port of Wilmington/DSPC, Presenting Sponsor RPS/Royal Fumigation, Premium Sponsors: Manfredi Cold Storage, The Pilots’ Association For the Bay and River Delaware, Dole Fresh Fruit, Western Fumigation, Giumarra International Marketing, and Corporate Sponsors: Dayka & Hackett, J&K Fresh East, Sbrocco International, Inc., Tastyfrutti International, Inc., Geodis USA, Ports of the Delaware River Marine Trade Association, Holt Logistics Corp., and Delaware River Stevedores. After recognizing special guests in attendance, the Presenting Sponsor, RPS/Royal Fumigation, was then brought to the stage. Anne Bookout of RPS/Royal Fumigation began her remarks by recounting when she was told that no two fumigations were ever the same, and has since learned that no two Chilean seasons are ever the same either. Bookout mentioned that RPS has decades of experience in handling Chilean fruit, fostering cooperation along the Delaware River, and of unifying support and efforts from the CACC. Bookout concluded her remarks with a brief introduction of Senator Alejandro Garcia-Huidobro. Senator Alejandro Garcia- Huidobro graciously thanked the Chamber for making such a wonderful event possible. He stressed the importance of regional- level work, and thanked the Delaware Valley for their continued support of trade and promotion of Chile. 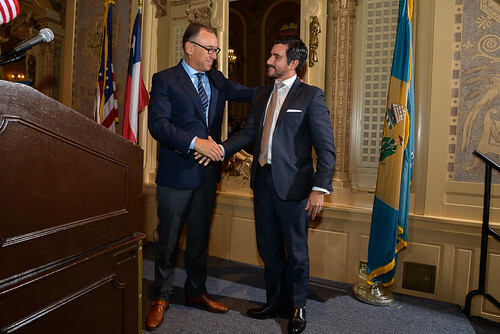 Senator Garcia- Huidobro informed the audience of his belief that events like the Taste of Chile enable Chile and the Greater Philadelphia area to forge political, economic, and cultural ties, all while not only reinforcing existing relationships, but creating new ones as well. He closed by reaffirming Chile’s commitment to international trade, and declared that Chile is absolutely committed to the Greater Philadelphia area. Translations from Spanish to English were done by Miriam Borja-Fisher. Guests enjoyed a delicious meal of fresh Chilean SuperSalmon provided by Agrosuper USA while listening to live music. After dessert, the program continued with remarks from the Vice President of the CACCGP and CEO of Tastyfrutti International Inc., Andreas Economou. 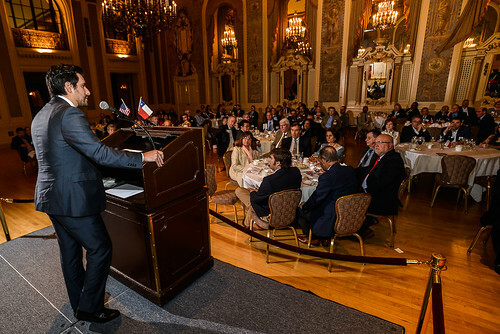 He remarked that he is sure that the future will hold bigger and better for the Greater Philadelphia Region and Chile. Economou then attributed the successful relationship between the Greater Philadelphia Region to Senator Garcia- Huidobro and gave a warm welcome to the entire delegation. Invited to the stage was the Visionary Sponsor of the evening, the Port of Wilmington, to present the 2017 Visionary Award. Francisco Labarca of Global Reefers, representing the Port of Wilmington, Delaware, graciously took the stage to present the 2017 Visionary Award to the award recipient: ProChile. 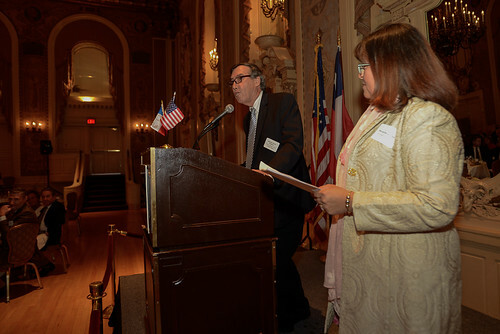 Labarca mentioned that the CACCGP’s Visionary Award was inaugurated in 2012 to recognize individuals and organizations for their outstanding work in building resilient international trade relationships between Chilean and US partners. He noted ProChile’s collaboration with the Chilean & American Chamber of Commerce, resulting in successful programs such as Chile Week. He mentioned how ProChile’s vision for Chile personifies the award criterion and is so very closely aligned with the Chamber’s mission of promoting free trade and business between Chile and the United States, and officially presented the 2017 Visionary Award to Rodrigo Contreras, Head Economic Department & Trade Commissioner from the Chilean Embassy and ProChile in Washington D.C, who accepted on behalf of ProChile. Contreras accepted the award with zeal, and took the chance to inform guests of the necessary involvement of Chile and the US. He stated that the US is the main source of FDI for Chile, and that ProChile’s aim is to strengthen relations between Chile and the Greater Philadelphia region. 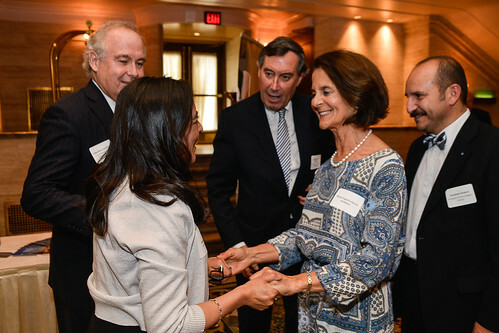 Contreras explained that the Greater Philadelphia area is a key location to strengthen trade and international relations, and said that the Chilean & American Chamber of Commerce is a key partner. He ended his remarks by reassuring those present that the Chilean delegation present is a strong symbol of Chile’s commitment to the CACC. 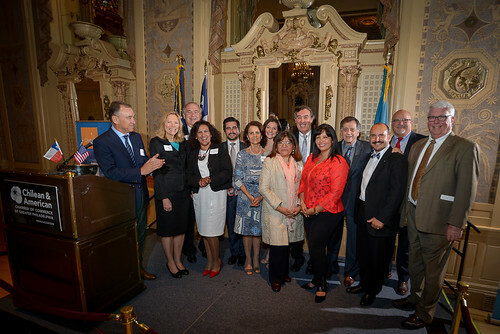 Following the remarks, Christina Lista, the Executive Director of the CACC, spoke about the importance of becoming a member, in order to not only maintain and increase the trade relationship, but the cultural and political ties between the Delaware River region and Chile. She then graciously invited guests to register for two upcoming events hosted by the CACC: International Soccer Night, and the Summer 2017 International Business Networking Reception. After thanking guests and sponsors alike for their support of the evening, Christina announced that the raffle winners will be chosen. One bottle of Santa Carolina Cabernet Sauvignon and Santa Carolina Sauvignon Blanc, as well as 4 tickets to the Phillies vs. Miami Marlins Game were raffled off to lucky guests. The CACCGP would like to extend a special thank you to all of the sponsoring companies and attendees of this esteemed event, and also to ProChile DC for facilitating the delivery of fresh Chilean Salmon for the evening. ¡Muchas gracias! 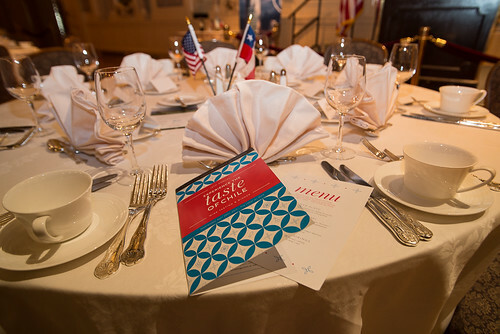 For more photos from the 12th Annual Experience the Taste of Chile, please visit our Flickr Page. Filed under News, Past Events.